A unique design of Caribbean architecture, expansive bougainvillea covered decks, and exotic Caribbean furniture add to the experience. The private infinity swimming pool with its waterfall offers a majestic setting for your retreat. The Wesley House can be rented as a one bedroom villa (main house only), a two bedroom, or as a three bedroom villa (main house and two bedroom guest suite). RATES SHOWN ARE FOR ONE BEDROOM. PLEASE CONTACT US FOR 2 AND 3 BEDROOM RATES. No Smoking allowed. Computer, Magic jack for free international calls, and cell phone provided at the house. Air-conditioned bedrooms, a gourmet kitchen, an outdoor BBQ grill and a home theater with cable/satellite TV enhance the pleasure of your stay. The extravagance of the Wesley House is enhanced by its master bedroom skylight that allows views of the Caribbean stars. Each air-conditioned bedroom has en suite bathrooms and opens onto wood deck with view towards the ocean. A washer and dryer are also included for your convenience. Wesley House is conveniently located just two minutes from the village of Island Harbour with its grocery stores and convenience stores -- and some of the best beaches, French bakeries, and restaurants the Caribbean has to offer. I recently enjoyed a week's stay at Wesley House, January, 2014, and it was an outstanding experience. When I am searching for my perfect vacation rental home I focus on 4 essentials: 1. Location 2. Comfort/Overall Quality 3. Cleanliness 4. Artistic & Natural Beauty of Property. Wesley House ranked high in every area! Location - Ideal, because it is a short drive to the most beautiful beach on the island, Shoal Bay Beach, and it is close to several outstanding restaurants and beach bars, On Da Rocks and Elodia's, to name a few. Comfort - The pergola covered deck, complete with hammocks swinging in the breeze and an outdoor dining/entertainment area, leads to the pool deck. This ample-sized deck, surrounded by gorgeous pink/coral Anguillan stone, offers spectacular views of the ocean and even neighboring islands such as St. Maarten. The crystal clear infinity pool itself was a delight for daily swims, clean, with comfortable water temperature. The peaceful deck is surrounded by brilliant flowering potted plants. The entire house is beautifully landscaped, and Hummingbirds, Gray Kingbirds, and Bananaquits make daily visits; they were a joy to watch. I enjoyed the interior comfort of Wesley House as well. Everything from the fine bed and bath linens to the well-stocked gourmet kitchen, newly installed Anguillan coral stone in the showers (complete with aromatic bath products), the soft, plump arm chairs in the living room, and the breakfast bar with high, wooden stools, contributed to the level of comfort I seek in a home. Cleanliness - Immaculate, and much appreciated. Artistic/Natural Beauty - The soft tones and colors throughout Wesley House were relaxing. Beautiful artwork on the walls and in the decor. The lighting, lovely French doors (kept open to allow soothing breezes to flow), central and open dining area able to seat 6, plus the personal entertainment options available from the DVD and book libraries, all contributed to personal enjoyment. The ambience of Wesley House, both indoors and outdoors, makes one happy to be in the Caribbean! I cannot imagine a more beautiful, comfortable, and memorable luxury vacation home to enjoy while vacationing on the island of Anguilla. Our family had one of the most relaxing and fun vacations we've had in a long time. We traveled as a couple with 3 children (ages 8-4) and Wesley House was the perfect decision as a place to stay for us. It is very private and the views are breathtaking! Location made it easy to try a new, beautiful beach each day. The staff was incredible, from the on-island manager Lisa, to the housekeeper (so kind), and the gardener Larry. They were friendly and knowledgeable. On-site amenities were terrific. The house has all of the necessities of home; a fully furnished kitchen, coolers and umbrellas for the beach, pool toys and rafts, an assortment of DVD's and books, and even a mini-van to drive around the island- everything has been thought of to make you feel right at home. The property is in fantastic condition and it is clear that the owner takes great care of this property. Of note: We needed to change our reservation to an early arrival due to a storm. The owner and on-island manager made the the change effortless and easy. Our refrigerator was stocked upon our early arrival and Lisa even drove us around that evening to find a restaurant last-minute, as we arrived late to the island. 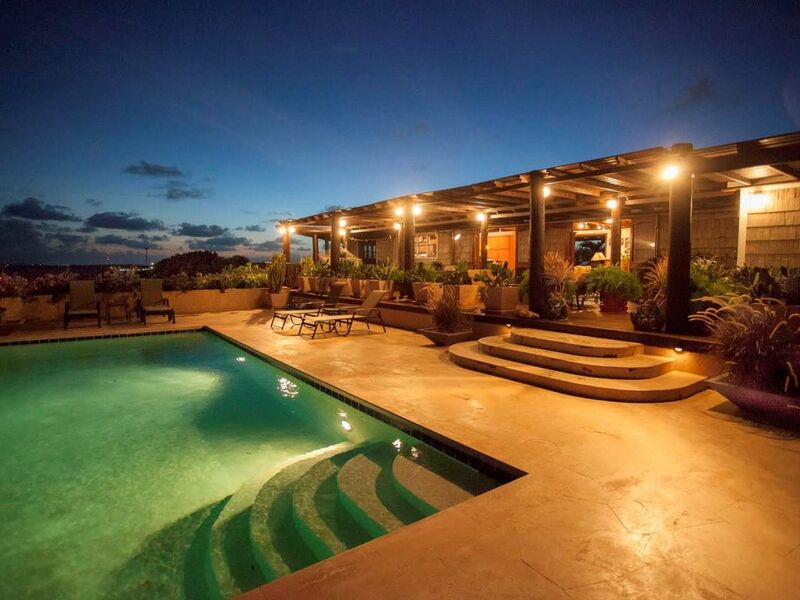 Wesley House is a great vacation rental in Anguilla! relatively short order. Brenda, the property manager, was also extremely helpful and pleasant. was honeymooning again with the kids and my mother in tow. We enjoyed excellent meals and tried to eat at only the locals' restaurants. is no question where we will stay. roosters - made be we will hear them in our dreams. Anguilla is a beach lovers paradise-- an island with miles of coastline where aquamarine waters meet blinding white sand. It's an intoxicating site, one you can indulge in for hours from the pool deck of the Wesley House. If you like sophisticated cuisine served in stunning open-air settings, Anguilla may be your culinary heaven. Anguilla is home to some of the finest dining in the Caribbean. World class eateries are located throughout the island. Or perhaps you prefer beach bars where you can sink your feet into the sand while eating, ribs, catch of the day, or grilled lobster. Enjoy the peaceful island life or for the more adventurous there is horse back riding, scuba diving, snorkeling, sailing, windsurfing, or just about any water sport available.